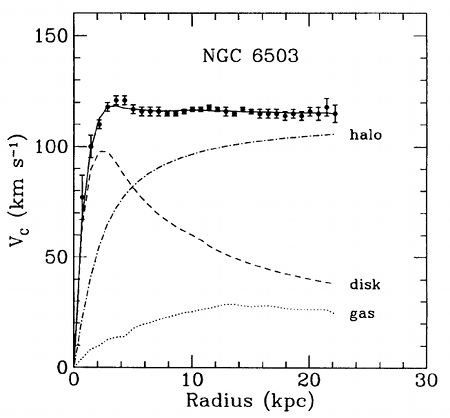 Indirect evidence for the presence of dark matter in galaxies: rotation velocity of the stars in the galaxy NGC6503 as a function of distance to the centre (data points). To explain the data out to larger distances (solid line), a matter contribution in the form of a dark matter halo has to be introduced. Taken from . Various independent astrophysical observations suggest that about 25% of the total energy density of the Universe, and more than 80% of its mass consists of an unknown component, called "dark matter". Historically, first observations suggesting the existence of dark matter took place in 1933, when F. Zwicky measured the velocity dispersion of galaxies in the Coma cluster. He found that, in constrast to the cluster mass inferred from the visible matter, 400 times that mass was necessary to explain the observated velocities. Another very convincing evidence for dark matter, this time on galactic scales, comes from the measurements of the circular velocities of stars and gas as a function of their distance from the galactic center, which are found "too fast" to be explained by Newtonian dynamics when only visible matter is taken into account (top figure). Recent impressive results from studies of the cosmic microwave background observed by the WMAP and Planck missions, together with supernova distance measurements and large scale galaxy surveys, have solidified the Standard Model of Cosmology. In this model, the structures observed in today's Universe (e.g. the distribution of clusters of galaxis, galaxies, voids) formed through gravitational amplification of small density perturbations with the help of cold dark matter. In this context, "cold" means that the dark matter particles had non-relativistic velocities when structures formed in the Universe. Without the existence of cold dark matter, the formation of structures as observed in the present Universe is hard to explain. Among the well-motivated elementary particle candidates for cold dark matter are so-called weakly interacting massive particles (WIMPs); these are (quasi-)stable particles which are supposed to interact only via the weak interaction, with masses and coupling strengths at the electroweak scale. Today, such WIMPs would have a relic density matching well the observed dark-matter density. However, the nature of dark matter is still unknown and the detection of a signal that could be associated with dark matter interactions remains major task in astroparticle and particle physics. It is assumed that the annihilation of WIMP dark matter results in standard model (SM) particles which undergo further decays, thereby producing, among other particles, gamma rays. In most theories, WIMP annihilation produces a continuum energy spectrum of gamma rays up to the DM mass as well as one or several mono-energetic gamma-ray lines. Although the fluxes of mono-energetic features are typically suppressed compared to the continuum, a gamma-ray line should be easy to distinguish from standard astrophysical gamma-ray backgrounds . Therefore, the detection of a gamma-ray line at energies of some 10 GeV or above, would be an unequivocal evidence of the annihilation of a new particle. For this reason, line signals are often referred as "smoking-gun" signatures of dark matter. The space-borne Fermi Large Area Telescope (Fermi-LAT) is well suited to detect monochromatic lines from dark matter annihilation. In 2012, an analysis of a 5-year data sample collected by Fermi-LAT in a sky region close to the Galactic Center resulted in a hint for a line-like signal at an energy of 130 GeV . However, the limited collection area of Fermi-LAT did not allow to make a conclusive statement about the statistical robustness of this signal. Other analyses suggested that the peak of the signal is at a location offset by -1.5° in Galactic longitude. Fig. 1: Significance map presented in Galactic coordinates. 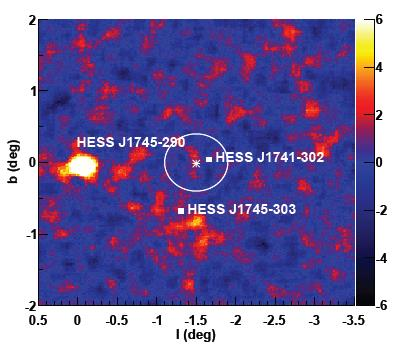 The known source HESS J1745-290 is detected, even at a large angular offset. In contrast, no emission is seen from in the target region centred on the 130 GeV excess (white circle). With the aim to either verify or falsify the signal, a new search for dark matter line-like signals in the vicinity of the Galactic Centre was performed by the H.E.S.S. experiment , based on data recorded in 2014. These dedicated observations were carried out with the complete HESS-II array, i.e. with five telescopes including newly installed 28m telescope, as this configuration allows to reduce the energy threshold compared to earlier observations . No significant excess associated with dark matter annihilation was found in the energy range between 100 GeV and 2 TeV with 18 hours of data. Figure 1 presents the significance map of the targeted region. Fig. 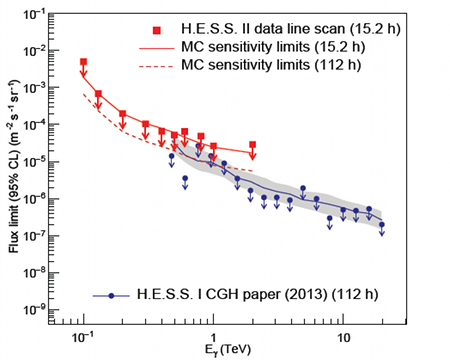 2: 95% confidence level limits on gamma-ray flux for a line scan between 100 GeV and 2 TeV (red data points) compared to former limits from H.E.S.S. I  (blue data points). 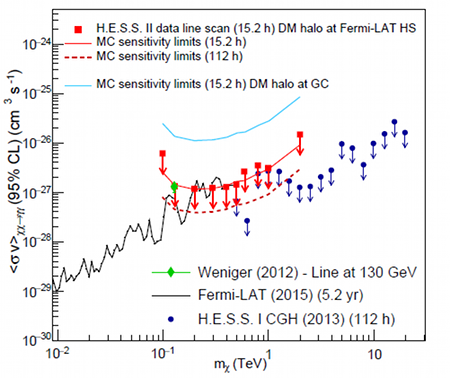 The red-dashed line represents the limits expected for 112 h of observation time, and the red solid line shows the expected limits for 15.2 h of observations, based on Monte Carlo simulations. In the second step, an event-by-event likelihood analysis was applied to search for line-like signals in the data. The analysis improves on our earlier results  both in sensitivity and in energy threshold. No line-like gamma-ray signal is found; therefore, upper limits on gamma-ray fluxes as a function were computed for gamma-ray line energies between 100 GeV and 2 TeV (Figure 2). Fig. 3: 95% confidence level limits on the WIMP annihilation cross-section weighted by WIMP velocity as function of WIMP mass (red points) obtained from the line scan between 100 GeV and 2 TeV. An Einasto dark matter profile peaking at Galactic coordinates (-1.5° 0°) is assumed. The light blue line indicates the same limits, but assuming that the dark matter halo distribution peaks at the Galactic Centre (0°, 0°). Earlier limits from H.E.S.S. I  and recent Fermi-LAT limits  are shown in blue and black, respectively. The flux calculated from the claimed 130 GeV line feature  is shown in green. Next, upper limits on the velocity weighted annihilation cross section of the dark matter were derived adopting a so-called Einasto dark matter halo profile, which describes a cuspy dark matter energy density distribution. As shown in Figure 3, the results of the new analysis overlap significantly in energy with previous Fermi-LAT and H.E.S.S.-I (four telescope) results. The new results allow to rule out the presence of the previously reported 130 GeV line-like signal (at 95% confidence level). As this result is obtained with an independent instrument, this ends the discussion on a presence of a 130 line-like signal originating from annihilation of dark matter particles. H. Abdallah et al. (H.E.S.S. Collaboration), H.E.S.S. limits on line-like dark matter signatures in the 100 GeV to 2 TeV energy range close to the Galactic Centre, Phys. Rev. Lett. 117, 151302 (2016). K. G. Begeman, A. H. Broeils, and R. H. Sanders, MNRAS 249, 523537 (1991). J. Conrad, J. Cohen-Tanugi, and L. E. Strigari, J. Exp. Theor. Phys. 121, 1104 (2015). C. Weniger, J., Cosmol. Astropart. Phys. 08 (2012) 007. M. Su and D. Finkbeiner, arXiv:1206.1616. A. Abramowski et al. (H.E.S.S. Collaboration), Phys. Rev. Lett. 110, 041301 (2013). M. Ackermann et al. (Fermi-LAT Collaboration), Phys. Rev. D 91, 122002 (2015).